A compulsively readable, remarkably candid memoir from world class ultra-marathon runner Charlie Engle chronicling his globe-spanning races, his record-breaking run across the Sahara Desert, and how running helped him overcome drug addiction…and an unjust stint in federal prison. After a decade-long addiction to crack cocaine and alcohol, Charlie Engle hit bottom with a near-fatal six-day binge that ended in a hail of bullets. As Engle got sober, he turned to running, which became his lifeline, his pastime, and his salvation. He began with marathons, and when marathons weren’t far enough, he began to take on ultramarathons, races that went for thirty-five, fifty, and sometimes hundreds of miles, traveling to some of the most unforgiving places on earth to race. The Matt Damon-produced documentary, Running the Sahara, followed Engle as he lead a team on a harrowing, record breaking 4,500-mile run across the Sahara Desert, which helped raise millions of dollars for charity. Charlie’s growing notoriety led to an investigation and a subsequent unjust conviction for mortgage fraud. Engle would spend sixteen months in federal prison in Beckley, West Virginia. While in jail, he pounded the small prison track, running endlessly in circles. Soon his fellow inmates were joining him, struggling to keep their spirits up in dehumanizing circumstances. In Running Man, Charlie Engle tells the gripping, surprising, funny, emotional, and inspiring story of his life, detailing his setbacks and struggles—from coping with addiction to serving time in prison—and how he blazed a path to freedom by putting one foot in front of the other. This is a propulsive, raw, and triumphant story about finding the threshold of human endurance, and transcending it. Charlie Engle is a world-renowned ultra-marathon runner, having won or placed in some of the planet’s most punishing long-distance footraces. In 2007, Matt Damon produced and narrated Running the Sahara, a film about Engle and his successful bid to become the first person to run 4500 miles across the Sahara Desert. Engle has been featured in Men’s Journal, Outside, National Geographic Weekend, Oxford American, Runner’s World, The Huffington Post, PBS’s Need to Know, NBC’s Rock Center with Brian Williams, The Tonight Show with Jay Leno, and NPR’s All Things Considered. He lives in North Carolina. 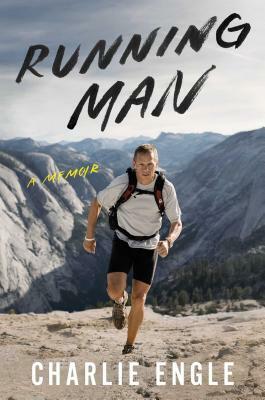 "Running Man is Charlie Engle’s rigorous and humane reckoning with his own extraordinary life. It follows him to wondrous and painful places—from triumphant determination on Andean peaks to desperation on the streets of Wichita, from camaraderie in the middle of the Gobi desert to despair and community in a West Virginia federal penitentiary. Engle is a man drawn to the sensation of pushing himself fully, and he’s found various kinds of extremity in all sorts of places—in a crack pipe and in a brutal four-month run across the length of the Sahara. He has also found himself, in powerful ways, in ordinary relationships—in partnership and fatherhood—and this book is a moving account of his attempt to reconcile his hunger for extremity with his commitments to the ones he loves. “Riveting. Running Man gets at the heart—better than anything I've ever read about endurance sports—of what compels a person to compete in the world's toughest foot races. Charlie probes his own life and psyche with remarkably honesty, offering the reader a portrait of a world class athlete, but also an addict, an inmate, a son, a father and a man committed to his own sobriety and sanity. Thanks to this book I finally understand what drives the spirit of ultra runners." --Chris Kostman, Chief Adventure Officer and Race Director AdventureCORPS, Inc.